It's back! check out our course load this 2018/19 season for topics you are interested in. Join us on a candlelit tour of Dalnavert after dark and find out why the Victorians were so obsessed with the macabre and the paranormal. 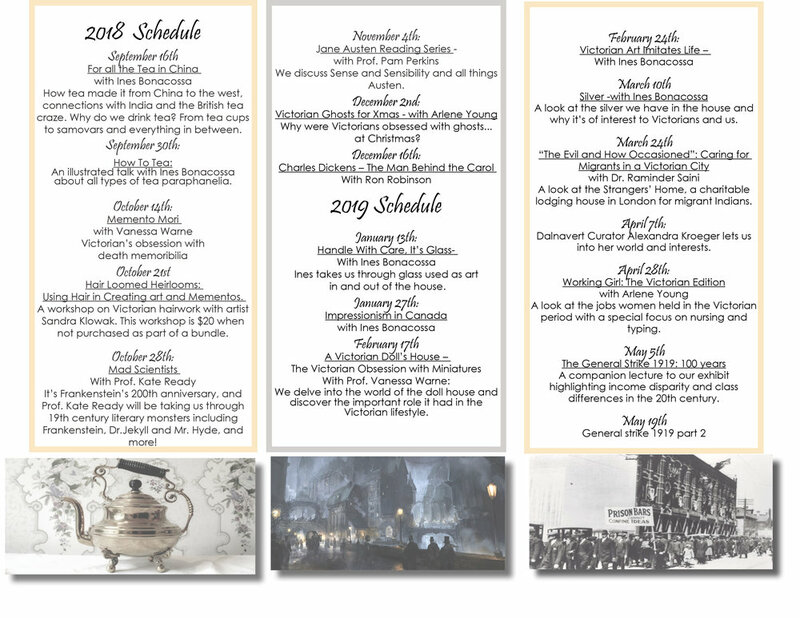 Learn about the Victorians' worst fears and hear about the traditions and rituals they created in order to keep spirits in or out of the spirit world. Teeming with atmosphere, the tour will end in the attic with a ghost story. Come alone at your own risk. *There is a sweet reward for those who come out the other side of the tour: A free take home Halloween treat by Oh Doughnuts! Art installations by Bolshevixen Art Kollectiv (Wendy Sawatzky and Danishka Esterhazy). Wendy Sawatzky’s ECTOPLASM! Which premiered at the Dalnavert Museum during Nuit Blanche will also be featured in the Dalnavert’s parlour. Hamilton Family Fonds photographs from University of Manitoba Archives & Special Collections. A guide will share the fears of Victorians, from a time when new technology collided with old traditions, resulting in strange and macabre new traditions. Audio installations of 19th century literature exploring these themes will be cast throughout the house and entice you to lean into the darkness. Finally, make your way into the attic, and as you settle into the shadows, listen to a classic Victorian ghost story by candle light.